Prion diseases are fatal neurodegenerative disorders and have great danger to animals and humans. But to now, no drugs and measures are used to treat and prevent this disease. Neurodegeneration can be prevented by Gleevec that regulates c-Abl tyrosine kinases. However, the protective effect of Gleevec against prion disease remains unknown. In the present study, the effect of Gleevec against prion neurotoxic-induced neuronal death was investigated by ThT fluorometric assay, CCK8 assay, TUNEL, TEM, Immunofluorescence staining and western blot. Results showed that Gleevec could deaden PrP106-126-mediated neurotoxicity in Neuro2A cells, rescue neurons from PrP106-126-induced apoptosis and abrogate PrP106-126- induced mitochondrial damage. This study is the first to demonstrate the protective effect of Gleevec against prion-mediated neurotoxicity. Our results suggested that Gleevec treatment may be a novel therapeutic strategy to treat prion-mediated neurotoxicity. Prion diseases are a family of fatal neurodegenerative disorders that affect various mammalian species, including animals’ scrapie and bovine spongiform encephalopathy [1-4] and humans’ Creutzfeldt-Jacob disease and fatal familial insomnia [5-8]. These pathologies are characterised by spongiform degeneration or vacuolation in the neuropil, glial activation, neuronal death by apoptosis [9-11] and accumulation of a protease-resistant form of the cellular prion protein (PrPC) called scrapie PrP (PrPSc) in the brain . The infectious PrPSc possibly functions as a template that promotes the conversion of numerous PrPC to PrPSc and amplified the infectious and toxic species. The neurotoxic prion protein fragment PrP106-126 exhibits physicochemical and pathogenic properties similar to PrPSc; in particular, PrP106-126 forms amyloid fibrils with a high β-sheet content, shows partial proteinase K resistance and elicits neurotoxicity in vitro [13-15]. These fibrils cause direct neuronal damage by interacting with cell surface components; such interactions trigger cell apoptosis signalling. Therefore, PrP106-126 is commonly used as a model system to study prion-induced neurodegeneration [16-18]. Gleevec (also known as imatinib mesylate), as a front-line drugs, has been used successfully . Some physiological effects of Gleevec are related to neuroprotective effects associated with Alzheimer’s disease and protective effects against Aβ toxicity both at the behavioural and morphological levels [20,21]. But the effect of Gleevec on prion-mediated neurotoxicity has remained unclear. To study the influence of Gleevec on the regulation of PrP106-126- induced apoptosis, the experiment was performed on Neuro2A cells. The results showed that neuronal cells exposed to Gleevec inhibited PrP106-126-induced neurotoxicity and mitochondrial dysfunction and proved that Gleevec may be used to treat the neurodegenerative disorders, including prion diseases. The mouse neuroblastoma N2a cell line (Neuro2A) were obtained from Xiehe Medical University, Cell Culture Center (Beijing, China) and cultured and maintained in a cell incubator at 5% CO2 and 37°C. The neurotoxic prion protein fragment (PrP106-126) were purchased from Sangon Bio-Tech, (Shanghai, China) and dissolved in 0.1 mol/l PBS to a concentration of 1 mM, and deviated from aggregate at 37ºC for 12 h. The experiments were conducted with final peptide concentrations of 100 μM. The fibril formation of PrP106-126 was measured by using a Thioflavine-T (ThT) fluorometric assay according to published reports . Cell viability was evaluated using a CCK-8 assay (Beyotime Biotechnology, Hubei, China). The cell survival ratio was expressed as the percentage of the control. The TUNEL assay was used to measure the degree of cellular apoptosis using an in situ Apo-BrdU DNA fragmentation assay kit (BioVision, San Francisco, CA, USA), following the manufacturer’s instructions. Briefly, equal amounts of proteins were separated by SDS-PAGE on 10-12% gels, and the separated proteins were transferred onto a nitrocellulose membrane. The antibodies used for immunoblotting were cytochrome c (Santa Cruz, CA, USA), Bax (Cambridge, MA, USA), BIM (BD-Pharmingen, USA), β-actin(Sigma-Aldrich, St Louis, MO, USA), anti-caspase9 (Boisynthesis Biotechnology, Beijing, China), or anti-active-caspase3 (Biosynthesis Biotechnology). Membranes were washed with TBS-T, and then incubated with the secondary antibody, goat anti-mouse IgG or anti-rabbit IgG conjugated to horseradish peroxidase (Beyotime Biotechnology, Hubei, China). Immunoreactive proteins were visualized after membrane incubation with enhanced chemifluorescence (ECF) reagent for 5 minutes, on an image system (Versadoc, Bio-Rad). The Neuro2A cells were fixed in 4% paraformaldehyde for 20 min at room temperature. Goat serum was added and incubated for 1 h. Rabbit anti-active caspase-3 and rabbit anti-caspase-9 were added, respectively, and incubated at 4ºC overnight. Goat anti-rabbit IgG Cy5 and FITC-conjugated antibody (Biosynthesis Biotechnology, Beijing, China) were added and incubated at 37ºC for 1 h. DAPI (Wuhan, Hubei, China) was added and incubated for 5 min. The neurons were finally mounted with glycerin buffer and examined under an OLYMPUS microscope immediately. Neuro2A cells were treated and then washed twice in PBS, trypsinized, resuspended in a fixative containing ice-cold 5% glutaraldehyde in 0.1 M sodium cacodylate buffer (pH 7.4) at 4ºC for 15 min, and then centrifuged. Cell pellets were fixed for 4 h. The cell pellet was further fixed in 1% OsO4 in 0.1 M sodium cacodylate buffer on ice for 1 h and dehydrated with acetone. The cell pellet was embedded in Epon 812 and polymerized at 60°C for 48 h. Ultrathin sections (70 nm) were obtained on a Leica Ultracut UCT ultramicrotome (Vienna, Austria) and counterstained with uranyl acetate and lead citrate before observation under a JEM-2100 TEM (JEOL, Japan). All assays were performed on three separate occasions. Data are expressed as means ± SD. Parametric data were analyzed using Student’s t-test or one-way ANOVA followed by post hoc Turkey’s test using the SPSS software (version 13.0: SPSS Inc., Chicago, IL, USA). *P<0.05 or **P<0.01 was considered significant. It was proved that the existence of amyloid aggregates in PrP106-126 preparations was detected by ThT fluorometric assay (Figure 1A).Then, the effect of Gleevec was examined on PrP106-126-induced neuron death. Neuro2A cells were treated with different concentrations of PrP106-126 for 0, 6, 12, 18 and 24 h. Afterwards, Neuro2A cell viability was detected by CCK-8 assay. We found that PrP106-126 treatment induced neuron death in cultures in a dose- and time-dependent manner (Figure 1B). However, Gleevec pretreatment inhibited PrP106-126-induced cell death in a dose-dependent manner. Furthermore, pretreatment with 5 or 10 μM Gleevec for 24 h completely abrogated PrP106-126-induced neuron death. Gleevec treatment alone did not affect the neural survival. The results showed that Gleevec protected neurons from PrP106-126-induced cell death (Figures 1A and 1B). Figure 1: Effect of Gleevec on PrP106-126 induced neuron death. A. Thioflavine-T (ThT) fluorometric assay showed the presence of amyloid aggregates in PrP106-126 preparations. B. Neuro2A cells were treated with PrP106-126 and passed away gradually in cultures. Data were expressed as mean±SD of triplicate experiments. (*p<0.05; **p<0.01). To determine the mechanism of PrP106-126-induced neuronal cell apoptosis, whether or not Gleevec can protect cells against prion-mediated neurotoxicity was examined by TUNEL, transmission electron microscopy (TEM), immunoflurescence staining and western blot. Initially, Neuro2A cells with or without 5 μM Gleevec pretreatment were incubated for 24 h and then exposed in 100 μM PrP106-126. Afterwards, the influence of Gleevec on PrP106-126-mediated neurotoxicity was investigated by TUNEL in Neuro2A cells. TUNEL staining showed that the treatment of Neuro2A cells with PrP106-126 alone resulted in neuronal apoptosis. However, the Gleevec pretreatment of neurons significantly inhibited PrP106-126-induced cell death (Figure 2A). 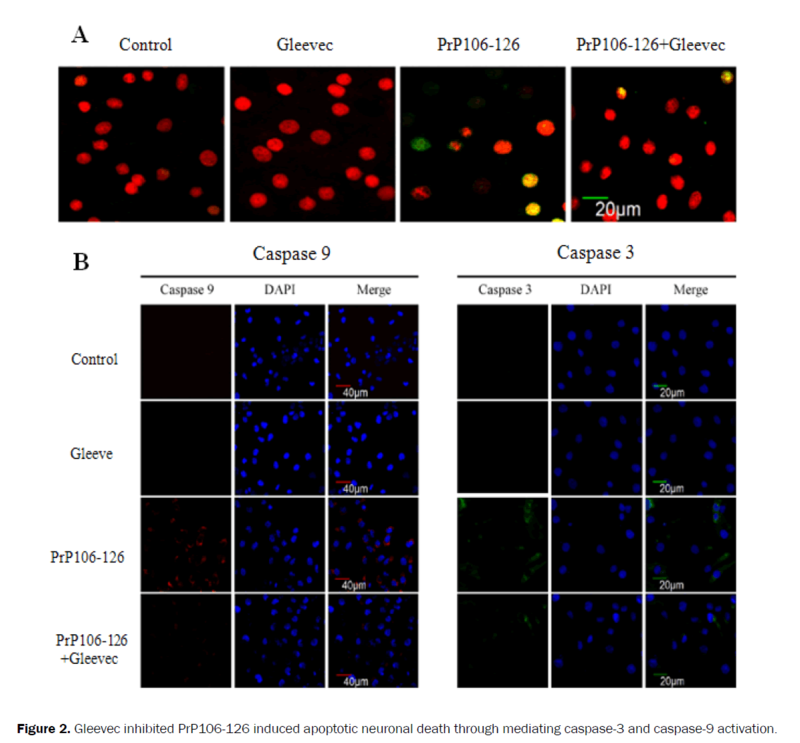 Figure 2: Gleevec inhibited PrP106-126 induced apoptotic neuronal death through mediating caspase-3 and caspase-9 activation. To determine the mechanism of PrP106-126-induced neuronal cell apoptosis, Whether PrP106-126 treatment activates caspase-9 and caspase-3, and whether Gleevec affects the activation of these caspases was researched by immunofluorescence staining. The subcellular distribution of activated caspase-9 and caspase-3 in Neuro2A cells exposed to PrP106-126 with or without Gleevec pre-treatment for 24 h was examined by fluorescence microscopy. The results showed that the neurons treated with PrP106-126 alone activated caspase-9 and caspase-3, but Neuro2A cells pretreated with Gleevec alleviated PrP106-126- induced cell death and the activation of caspase-9 and caspase-3 (Figure 2B). Consistent with these findings, western blotting results showed that the cleavage of caspase-9 and caspase-3 to their respective subunits p35 and p17 was significantly reduced in Neuro2A cells pretreated with Gleevec. The activation of caspase-9 and caspase-3 cascade was subjected to densitometric quantification analysis; the results showed that the Gleevec treatment of Neuro2A cells significantly reduced the cleavage of caspase-9 and caspase-3 compared with the PrP106-126-treated group; this reduction reached 61% and 57%, respectively (Figures 2A and 2B). A. The neurons pretreated with Gleevec barely decreased aginst PrP106-126-mediated neurotoxicity (Bar=20 μm). B. Neuro2A cells pretreated with Gleevec alleviated the activation of caspase-9 (Green, Bar=40 μm) and caspase-3 (Red, bar=20 μm) during opposing PrP106-126-induced cell death. Nuclei were stained as blue by DAPI. To confirm whether or not morphological changes occur in response to PrP106-126 treatment, Neuro2A cells were observed using TEM. The results showed that typical apoptotic hallmarks, such as chromatin rearrangements, condensation or releasing into the cytoplasm, nucleolus condensation (Figure 3C) and formation of apoptotic bodies (Figure 3D), were observed in the PrP106-126-treated cells. TEM showed that the organelles of the neurons treated with Gleevec remained largely intact (Figure 3E), although the cells displayed deformed mitochondria with abnormally swollen cristae and appeared the phenomena of exocytosis (Figure 3F). 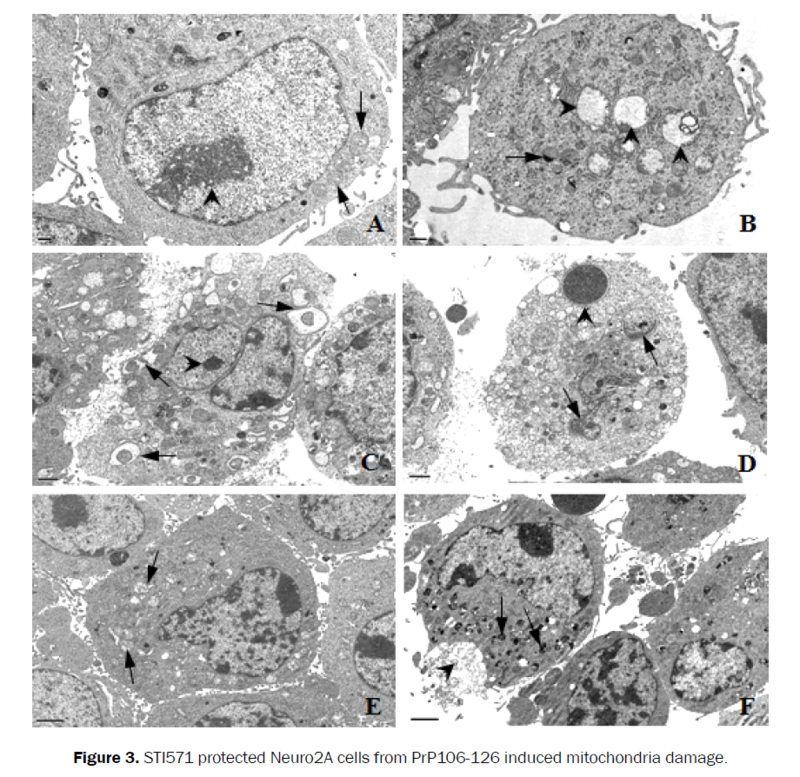 Figure 3: STI571 protected Neuro2A cells from PrP106-126 induced mitochondria damage. The results can prove that Gleevec blocks PrP106-126-induced apoptosis. To study whether or not morphological changes in mitochondria occur in response to PrP106-126 treatment, the mitochondrial ultrastructure was observed by TEM. Diversity and multiform in the structure and morphological characteristics of mitochondria were observed under different treatments. In normal neurons, mitochondria are dense and found in oval or round form with intact cristae (Figure 3A). By contrast, Neuro2A cells infected with PrP106-126 displayed abnormal mitochondrial morphological characteristics. Affected mitochondria appeared vesicular, swollen with a vacuolar appearance, decreases in number, integrated disappearance and ruptured cristae and aroused autophagy in cytoplasm at 24 h post-infection a (Figure 3B). Furthermore, nucleoli condensation, heterochromatin margination and lots of autophagosome (Figure 3C) were observed, and apoptotic body and autolysosomes formation (Figure 3D) appeared in the injuried cells. The mitochondria in neurons treated with Gleevec and PrP106-126 showed normal morphological or mild swelling characteristics and intact cristae (Figure 3E), although some cells displayed deformed mitochondria with abnormally swollen cristae (Figure 3F). These results indicated that Gleevec treatment prevented PrP106-126-induced mitochondrial damage. Autophagolysosomes. A. The normal morphology of nucleus with a clear nucleolu (arrowhead) and round mitochondria with intact cristae. B. swollen mitochondria with disrupted cristae were becoming big vacuoles (arrowhead). There were some autophagy (arrow) in cytoplasm. C. Nucleolus condensation (arrowhead) and lots of autophagosomes (arrow) were in the injuried cell. D. apoptotic body (arrowhead) and autolysosome (arrow) formation appeared in the injuried cell. E. mild swelling mitochondria with intact cristae (arrow). (F) there were some abnormal mitochondria (arrow) in cytoplasm and exocytosis was examined in neuron pretreated with Gleevec. Prion diseases are fatal neurodegenerative and infectious disorders, but at present no therapeutic or prophylactic regimens have been developed. The main component of prion disease is the abnormal isoform of prion protein (PrPSc) [23,24]. PrP106-126 maintains the neurotoxic characteristics of the entire pathological PrPSc and is commonly used as a model to study the mechanism of prion disorders . Although the mechanisms of PrP106-126-induced neuron death remain poorly understood, PrP106-126- induced apoptosis is mediated by oxidative stress and mitochondrial disruption in neuroblastoma cells [26,27]. Clinical drugs, such as melatonin, gingerol and resveratrol, can protect neurons from PrP106-126-induced neuron death. Although Gleevec, the inhibitor of c-Abl tyrosine protein kinase, provides considerably effective treatment for neurodegenerative diseases and chronic myeloid leukemia, the effect of Gleevec on prion disease has not been fully understood. Previous studies demonstrated that Gleevec reduced the level of PrPSc in prion-infected ScN2a cells in a time- and dose dependent manner. PrPSc was significantly decreased by Gleevec treatment in scrapie-infected mouse spleens as well as in ScN2a cells. These results suggest that Gleevec may have clinical benefits when it is used as neuro-chemotherapy for prion diseases. However, neither intraperitoneal nor intracerebroventricular delivery of Gleevec exerted any PrPSc clearance effect in the central nervous system. Direct injections of Gleevec into the brain at a dose of 400 μg/kg/injection did not have any effect on PrPSc accumulation in the brains as well as survival time of the scrapie-infected mice. The failure of chemotherapy could be attributed to the imbalance between cellular uptake and efflux of drugs that results in inadequate intracellular drug concentration. Moreover, PrPSc reappeared in the spleen but not in ScN2a cells when the drug treatment was stopped, indicating different response of various cell types in PrPSc clearance by Gleevec [28,29]. In the present study, it is proved that Gleevec played a protective role against PrP106-126-induced neuron death by regulating mitochondrial homeostasis and alleviated the activation of caspase-9 and caspase-3 by reducing the cleavage of caspase-9 and caspase-3 and the formation of their subunits, such as p35 and p17. Thus, Gleevec was not only involved in PrPSc clearance but also participated in inhibiting PrP106-126-induced neuron apoptosis. So, Gleevec may be developed as a potential therapeutic drug against prion infection. Autophagy may cause beneficial or harmful effects, such as cell survival or cell death . For example, autophagy may induce cell death in neurodegenerative diseases in which aggregates accumulate and cause pathological conditions . Pan et al. observed the presence of auto lysosomes and autophagosomes in dying Neuro2A cells exposed to PrP106-126 peptide . In this study, a high number of auto lysosomes and autophagosomes were also observed in neurons treated with PrP106-126. On the one hand, autophagy can accelerate the progression of disease in many cases; on the other hand, autophagy elicits protective effects against mitochondrial damage . Other studies have shown that autophagy prevents neurodegenerative disorders, including Alzheimer’s and Parkinson’s diseases, by inducing autophagy-mediated clearance of mitochondrial abnormalities [34,35]. Furthermore, drugs, such as melatonin  and resveratrol , protect neurons against PrP106-126-mediated neurotoxicity by activating the autophagy pathway. Interestingly, a small number of auto lysosomes were observed in Neuro2A cells pretreated with Gleevec and exposed to PrP106-126. Nevertheless, our results indicated that Gleevec-induced inhibition of c-Abl tyrosine kinase prevented the formation of auto lysosomes and auto phagosomes in Neuro2A cell and protected neuronal cells from prion fragment-induced cell death. However, the prevention of autophagy by Gleevec could also be another consequence, in addition to the inhibition of the mitochondrion-mediated apoptosis, rather than a direct inhibition of autophagy. These differences may indicate that autophagy is implicated in various processes in prion disease progression at different stages of cellular lesions, extracellular environment and therapeutic interventions . Whether autophagy plays a protective or harmful role in neurodegenerative diseases is yet to be established. This study is the first to demonstrate the protective effect of Gleevec treatment against PrP106- 126-mediated neurotoxicity. Gleevec may be the main factor for the related-prophylactics of prion-mediated neuronal cell death and mitochondrial damage. This work was supported by the National Natural Science Foundation of China (Project No. 31372407). Chong A, et al. Archival search for historical atypical scrapie in sheep reveals evidence for mixed infections. J Gen Virol. 2015;96:165-178. Arnold M and Ortiz-Pelaez A. The evolution of the prevalence of classical scrapie in sheep in Great Britain using surveillance data between 2005 and 2012. Prev Vet Med. 2014;117:242-250. Boujon C, et al. Atypical variants of bovine spongiform encephalopathy: rare diseases with consequences for BSE surveillance and control. Schweiz Arch Tierheilkd. 2016;158:171-177. Greenlee JJ and Greenlee MH. The transmissible spongiform encephalopathies of livestock. ILAR J. 2015;56: 7-25.
de Villemeur TB. Creutzfeldt-Jakob disease. Handb Clin Neurol. 2013;112: 1191-1193. Atalay FO, et al. Creutzfeldt-Jakob disease: report of four cases and review of the literature. Turk Patoloji Derg. 2015;31:148-152. Forloni G, et al. Preventive study in subjects at risk of fatal familial insomnia: Innovative approach to rare diseases. Prion. 2015;9:75-79. Llorens F, et al. Fatal Familial Insomnia: Clinical Aspects and Molecular Alterations. Curr Neurol Neurosci Rep. 2017;17:30. Song Z, et al. Molecular mechanisms of neurodegeneration mediated by dysfunctional subcellular organelles in transmissible spongiform encephalopathies. Acta Biochim Biophys Sin. 2013;45:452-464. Saá P, et al. Mechanisms of prion-induced neurodegeneration. Expert Rev Mol Med. 2016;18:e5. Song ZQ, et al. Overexpression of BAT3 alleviates prion protein fragment PrP106-126-induced neuronal apoptosis. CNS Neurosci Ther. 2014;20:737-747. Prusiner SB. Creutzfeldt-Jakob disease and scrapie prions. Alzheimer Dis Assoc Disord. 1989;3:52-78. Heegaard PM, et al. Amyloid aggregates of the prion peptide PrP106-126 are destabilised by oxidation and by the action of dendrimers. FEBS Lett. 2004;577:127-133. Shi F, et al. Inhibition of phagocytosis reduced the classical activation of BV2 microglia induced by amyloidogenic fragments of beta-amyloid and prion proteins. Acta Biochim Biophys Sin. 2013;45:973-978. Moore RA, et al. Proteomics analysis of amyloid and nonamyloid prion disease phenotypes reveals both common and divergent mechanisms of neuropathogenesis. J Proteome Res. 2014;13:4620-4634. Gu Y, et al. Prion peptide 106-126 modulates the aggregation of cellular prion protein and induces the synthesis of potentially neurotoxic transmembrane PrP. J Biol Chem. 2002;277:2275-2286. Henriques ST, et al. PrP (106-126) does not interact with membranes under physiological conditions. Biophys J. 2008;95:1877-1889. Perez M,et al. Prion peptide induces neuronal cell death through a pathway involving glycogen synthase kinase 3. Bioche J. 2003;372:129-136. Huang DY, et al. STI571 reduces TRAIL-induced apoptosis in colon cancer cells: c-Abl activation by the death receptor leads to stress kinase-dependent cell death. J Biomed Sci.2012;19:35. Cancino GI, et al. STI571 prevents apoptosis, tau phosphorylation and behavioural impairments induced by Alzheimer's beta-amyloid deposits. Brain. 2008;131:2425-2442. Sutcliffe JG, et al. Peripheral reduction of beta-amyloid is sufficient to reduce brain beta-amyloid: implications for Alzheimer's disease. J Neurosci Res. 2011;89:808-814. LeVine HR. Thioflavine T interaction with synthetic Alzheimer's disease beta-amyloid peptides: detection of amyloid aggregation in solution. Protein Sci. 1993;2:404-410. Aguib Y, et al. Autophagy induction by trehalose counteracts cellular prion infection. Autophagy. 2009;5:361-369. Sakudo A and Ikuta K. Prion protein functions and dysfunction in prion diseases. Curr Med Chem. 2009;16: 380-389. Ugalde CL, et al. Pathogenic mechanisms of prion protein, amyloid-β and α-synuclein misfolding: the prion concept and neurotoxicity of protein oligomers. J Neurochem. 2016;139:162-180. Thellung S, et al. p38 MAP kinase mediates the cell death induced by PrP106-126 in the SH-SY5Y neuroblastoma cells. Neurobiol Dis. 2002;9:69-81. Yuan F, et al. Cellular prion protein (PrPC) of the neuron cell transformed to a PK-resistant protein under oxidative stress, comprising main mitochondrial damage in prion diseases. J Mol Neurosci. 2013;51:219-224. Yun SW, et al. The tyrosine kinase inhibitor imatinib mesylate delays prion neuroinvasion by inhibiting prion propagation in the periphery. J Neurovirol. 2007;13:328-337. Ertmer A, et al. The tyrosine kinase inhibitor STI571 induces cellular clearance of PrPSc in prion-infected cells. J Biol Chem. 2004;279:41918-41927. Marino G and Lopez-Otin C. Autophagy: molecular mechanisms, physiological functions and relevance in human pathology. Cell Mol Life Sci. 2004;61:1439-1454. Shintani T and Klionsky D J. Autophagy in health and disease: a double-edged sword. Science. 2004;306:990-995. Pan B, et al. c-Abl Tyrosine Kinase Mediates Neurotoxic Prion Peptide-Induced Neuronal Apoptosis via Regulating Mitochondrial Homeostasis. Mol Neurobiol. 2014;49:1102-1116. Graef M and Nunnari J. A role for mitochondria in autophagy regulation. Autophagy. 2011;7:1245-1246. Filomeni G, et al. Neuroprotection of kaempferol by autophagy in models of rotenone-mediated acute toxicity: possible implications for Parkinson's disease. Neurobiol Aging. 2012;33:767-785. Heiseke A, et al. Lithium induces clearance of protease resistant prion protein in prion-infected cells by induction of autophagy. J Neurochem. 2009;109:25-34. Jeong JK, et al. Melatonin-induced autophagy protects against human prion protein-mediated neurotoxicity. J Pineal Res. 2012;53:138-146. Jeong JK, et al. Autophagy induced by resveratrol prevents human prion protein-mediated neurotoxicity. Neurosci Res. 2012;73:99-105. Eskelinen EL. Maturation of autophagic vacuoles in Mammalian cells. Autophagy. 2005;1:1-10.